Happy Wednesday everyone! 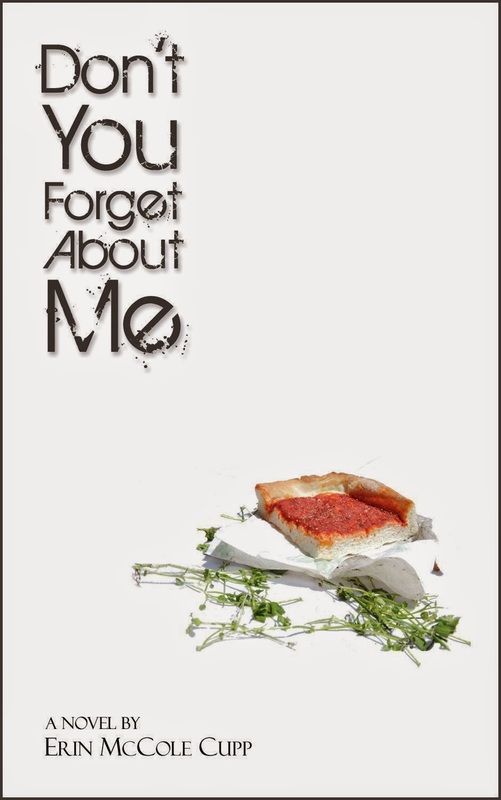 It's another book club day, and today we have a Catholic fiction selection, Don't You Forget About Me, paired up with an author interview with Erin McCole Cupp! We'll circle back to that in a moment. :0 Let's start with some information about the book, and my thoughts and questions for Erin. Away we go! I read a lot of fiction, but fiction written from a Catholic perspective is not so easy to come by. When I learned about Don't You Forget About Me, I couldn't *wait* to download and get started reading it. As a bonus, this is a mystery, a genre that I adore. Fascinating fodder in there, no?! This story moves FAST, I read it quickly because I could hardly put it down once I got going. I also related very much to the main characters. Cate is reflecting back on her childhood during the 1980's, and although I was younger than her at that time, I too recall and grew up during that time period. Fabulous references. :) And the moral theology woven into this fast-paced, well-written story...well, that is just priceless. A great read. I definitely suggest that you download this to your Kindle/Kindle app. At just $3.99, it's a steal! 1. What drew you to craft a mystery story rather than another type of fiction? Are you a mystery fan yourself? Hmm… well, to answer the second part of this question, I thought I wasn’t a mystery fan, but it turns out I am! When the story for Don’t You Forget About Me showed up in my brain as a murder mystery, I kind of turned to God and said, “This isn’t the kind of thing I read. Are You quite sure You want me on this one?” I mean, I’ve read a couple of Janet Evanovich’s Stephanie Plum books, but otherwise I’m more of a science fiction, YA, classics and literary reader. So when it came time to hammer out the plot structure for DYFAM, I sat down and did a Theatre 101 analysis of one of my favorite X-Files episodes, “Darkness Falls.” I’m not embarrassed to say that I cut my writing chops in the school of fanfiction. I think Cate may have showed up ginger in a subconscious homage to Agent Scully, even though the two are so completely different in terms of internal character. That and Cate’s tall. Her feet reach the pedals. I digress. 2. The setting for this book in and around a Catholic school in suburban Philadelphia felt quite vivid and personal. What of your own background is reflected in this aspect, or others, of the story? Ergh… this is a tough question to answer because the prideful writer in me wants to say that everything I’ve ever written is completely outside of myself… but who am I kidding? It’s not. Even in my science fiction novel, there’s still something of the familiar (to me, at least) even in that (not literally) alien of a setting. Anyway. Yes, I went to Catholic schools in the Philly suburbs, and yes, the town where I grew up is home to a couple of Superfund sites. That was just a jumping-off point, though. Walkerville is not the town where I grew up. Our Lady of the Seven Dolors does not exist. And so on. 3. The friendship between Cate and Staz is pivotal to the story. Do you have a similar friendship in your own life, and if so how did this influence the way you wrote these characters? I do! I totally do! Nada, my BFF from college, was completely the inspiration for Staz, though I tend to think of myself as her Staz, since I’m the married sidekick and she’s the single adventurer. The funny thing is that Nada and I became friends at our Christopher House, the campus Catholic community center. Yes, she’s a convert but not from Judaism, so I’m still not quite sure how or why Staz showed up Jewish. All I know is that when I said her first name out loud for the first time, I just sort of said, “Oh. Okay. She’s Jewish.” I have a number of Jewish friends and family members, however, so maybe that part of my roots showed through in Staz. 4. How easy (or difficult) was this book to maintain is Catholicity without losing a secular audience? In my opinion, you carried this off flawlessly. Oh, my goodness, thank you! That’s, like, the best compliment. I think that, since I considered myself a writer before I had my reversion experience in college, I’ve thought in terms of story for longer than I’ve thought in terms of evangelism. As a writer, I’ve always just wanted to tell the Truth, even when I didn’t recognize that that had been my aim. On one hand, I think that makes my work less “message-centric” and more about the story, which I hope would be appealing across faith lines. On the other hand, that mindset can take the whole apostolate thing out of writing novels, so I have to be careful not to cower behind the fiction façade. Does that make any sense? 5. Who is Cate? Is she you, or a composite of you and some other heroines you’ve undoubtedly met! That is a really, really hard question to answer. I think Cate is my opposite in that she and I faced some of the same choices and took completely different paths. Why would a Catholic writer write a character who is so… not? I think it comes down to my adoring bafflement with people in my life who have Truth staring them in the face, shouting at them and waving its arms, and they just kind of glide on by as if nothing happened. What is going on with them, and why is it so different from what is going on with me? They’re certainly bright enough. They’re loveable. Why do they think so differently, then? Cerebrally, I know it all boils down to the fact that faith is a gift. I'm still baffled. Cate was the hardest character to write. Has anyone else read Don't You Forget About Me? Leave a comment with your thoughts!